Earlier this week T brought home a basket of peaches from work. Immediately my mind started going crazy thinking of the different ways we could use them. I absolutely love peaches in the summer time. I started looking around in our pantry to see what other ingredients we had on hand, and what we could come up with. 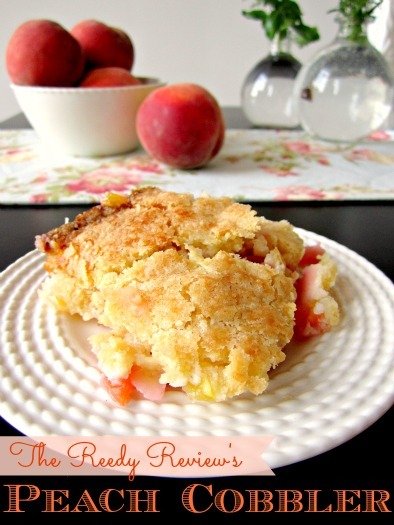 We settled on this simple peach cobbler, and it turned out so well! Preheat oven to 375 degrees F. Place peaches in the bottom of a greased 8x8 baking dish and sprinkle 1 Tbsp of sugar over them. In medium mixing bowl, sift all dry ingredients. Cut in butter and add beaten egg. (If you don't know how to cut in butter check out a video tutorial here.) Mix until crumbly and sprinkle over fruit, covering all exposed fruit. Bake for 35 minutes until golden. I must admit, I completely forgot to add the baking powder, and it turned out just fine. Baking powder should make the cobbler rise, making it lighter in texture. I'll be interested to use the baking powder next time to see what difference it makes! Incredible! This looks fantastic and that photo is lovely. Pinning it now! Clicked over from A Liz Adventures. This looks so easy and excellent. Pinning it!